Please note the adult warning for Bayou Noel. “This delicious holiday novella is a gateway drug to the addictive Bayou Heat series.” Come on. Everyone is doing it (in these books!). Granted, it is the holiday, which means that hopefully the vast majority of romance readers have more time off for reading. Add to that this novella is a mere 60 pages and you can devour it between ham bastings. The best part is that, like me, you can read it with zero knowledge of the series and no difficulty understanding anything. (And then, like me, run out and buy the first six books of the series which you read while your husband watches three football games in a row.) Since Bayou Noel is currently free on Amazon – and a great deal that I featured in my Sunday Reflection post yesterday) – you can read it and see if you like the writing of Alexandra Ivy and Laura Wright. I certainly did! Set in the world of the Pantera, mythical puma shifters living in an enchanted world in the Louisiana bayou where humans cannot enter, this book is a prequel (and should actually be labeled book #0.5) since it happens prior to Raphael finding his mate in the magical human Ashe in book one of the Bayou Heat series. The Pantera work hard to insure the safety of their people, particularly since their numbers are dwindling with no new babies in the last 50 years. They may be a long-lived species but mated pairs want cubs. With the Nurturers handling the medical and personal care, the Suits handling diplomacy and business out in the human world, and Hunters insuring the safety of their people, each person is sure that their efforts help their friends and family. Garrick knows that his work on behalf of the Pantera is worthwhile. Coming from a long line of diplomats, he’s seen the sacrifices his family have personally made for their people which is why he’s busy in Paris negotiating the purchase of a safe house. Returning to his apartment, he’s immediately cheered to see a letter from home. Molly, his elderly mother’s caregiver, always sends him missives filled with humor and all the news of the bayou and these notes continue to keep him strong. He’s naturally shocked and borderline ballistic when the letter he thought was a newsy installment instead turns out to be Molly’s resignation. Without even thinking about it, he books a flight to Louisiana. Molly is sad to be leaving the pithy, elderly Virginia but she knows it’s the right choice to go back to Medical for her career and her personal peace of mind. She’s loved Garrick for five years, the two of them pouring out their hearts and minds to each other in their letters, but every time he’s come home (and that hasn’t been often), he’s treated her like an aloof employer. She needs to give up on her dream of him and even Garrick bursting on the scene and ordering her not to leave is not going to dissuade her. But for all his bluster, can Garrick face what’s between them with courage, or will he simply run away again? Garrick is the ultimate, oblivious alpha male. Everyone around him can clearly see that he’s desperate to mate Molly if not for the emotional baggage he’s carrying from his childhood, baggage she has no knowledge of since he’s managed not to mention it in his letters. Molly is the spunky heroine we all are bound to admire who won’t let herself be used by Garrick when her heart is on the line – she’s strong enough to demand all or nothing and you’ll be ready to cheer her on even after a short acquaintance. The Bayou Heat Bundle (the first six books of the series) – a steal for only $4.99 when the books would normally cost you around $7, plus you can get Bayou Noel for free! 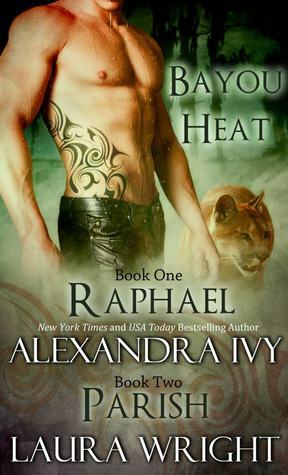 In sixty pages, the talented team of Alexandra Ivy and Laura Wright managed to have me order the first book of the Bayou Heat series, Raphael/Parish, which then led me to return it so I could instead purchase the very affordable (and better financial deal) of the Bayou Heat Bundle which includes books 1 – 6 and is only $4.99. As each “book” is only just under 100 pages, and they each have a cliffhanger ending which takes you right into the next one of the series focusing on another couple, I’m going to strongly recommend that you’ll want to prepare yourself for needing to know what’s next. These are fun, almost breezy paranormals which nevertheless possess interesting world-building and a compelling story arc of a vivid human threat to the Pantera’s existence. Paranormal romance readers looking for a free holiday read as a present, shouldn’t hesitate to download this story – just be warned. One hit will not be enough!